Employees carry two handsets on their belt clips as they work in the warehouse: One Motorola or Nextel 2-way radio, and one cordless phone. 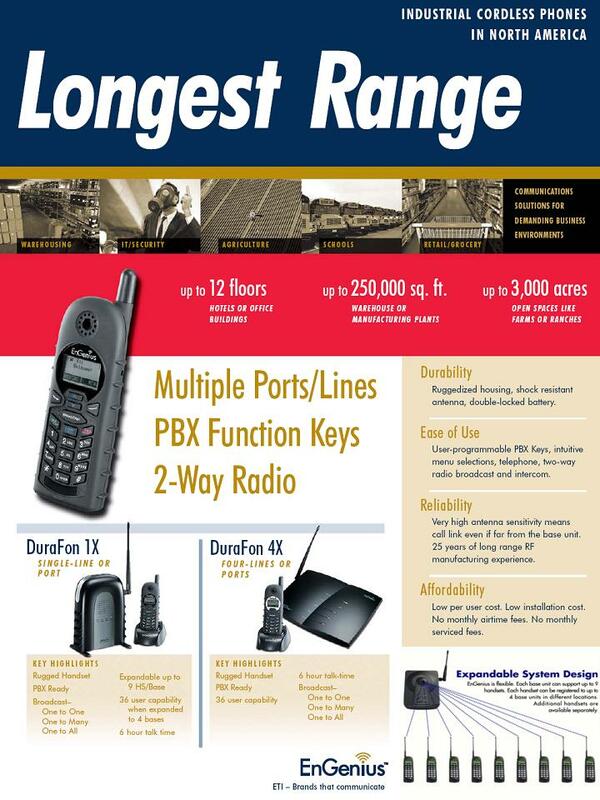 The 2-way radio incurs monthly airtime charges or licensing fees and the cordless phones get inadequate range. Furthermore, handsets break easily and all communication signals are lost if the employee travels into an area with metal walls, such as a freezer. Replace Motorola or Nextel 2-way radio and existing cordless phone with a phone system that has a handset capable of doing both functions. EnGenius DuraFon handsets operate both as a cordless phone and as a 2-way radio and units are also capable of broadcasting to one or all units. Broadcasting communication and cordless phone use will still be available if an employee walks into a metal freezer if the base system is set up using an antenna splitter inside the freezer. There are no monthly airtime charges or licensing fees and phones are drop tested on concrete, so they are durable. Coverage is long range, spanning 250,000 sq feet in a warehouse environment, an area equivalent to the size of 2 large Home Depots! Attention U.S. customers: EnGenius product has NO manufacturer's warranty unless purchased from an EnGenius Authorized Reseller. unauthorized dealer, you will pay $199 PLUS repair charges, if you need service. To verify a reseller is an authorized, please contact Engenius at 888-735-7888. The Engenius wireless system can be used as a stand alone system of can integrate to most PBX/Key Systems such as AVAYA, Toshiba, Panasonic, NEC, etc. Copyright ® 2014 Semper Fi Voice & Data Systems.